Well if you don't know, now you know, we here at da' salad have been going at it for a little over a year now. I'm sorry if you did not get to attend the lavish party Beyonce and Jay- Z held for da' salad at New Caledonia- it was a blast! holla at cha' boy J-Hova!!! But let us keep it real... and old skool. Let's go back to one of my first posts way back on July 3rd of the lord's year 2012, entitled Let us Consider Grass in which I ponder a Mesozoic world lacking that most ubiquitous of contemporary plant types: grass. Given that the Mesozoic produced diverse and magnificent megaherbivores, several orders of magnitude larger than grass fed Cenozoic mammalian megaherbivores, but on a diet of largely non-flowering plants... what was the preferred graze for dinosaurs? How did these ecosystems function without grass? Simply put if you were a Mesozoic rancher with a herd of iguanodonts on Cretaceous Spitsbergen, Norway what fodder would you collect for the winter in lieu of hay? Now the classic answer you get is that ferns filled the role of grasses during the Mesozoic and the term 'fern prairie' has become quite widespread in usage. And indeed there is probably much truth to this conceptual model of 'fern prairies' but I believe it is a loaded term. It fills a conceptual void in our head- when we think of large mammalian herbivores we think of big wide open spaces....the Serengeti....the great plains of North America.... the pampas of South America... and the substate these animals are moving upon and living on is grass. But how do you make a 'fern prairie' in the Mesozoic? There are some conceptual and logistic problems. Ferns replicate not by seed but by spore in a strange alternation of generation life cycle which, in order to fully complete, requires sufficient water for the sperm to literally swim through a film of water and fertilize the gametophyte and produce the sporophyte (adult plant). It is a ludicrously complicated system and this page here explains it better than I can, please view. This reproductive strategy in the Mesozoic which, if I can paint with some broad strokes, was overall hotter and drier than modern times definitely poses some problems for ferns. These issues are exacerbated when you take the fern out from under shaded canopy and put it on a sun-scorched plain. But all is not lost for the 'fern prairie'. Monsoonal climates may have seasonally produced sufficient moisture in short burst to allow this type of reproduction, and ferns today actually exist in true desert environments as I discussed here where many species accelerate their reproduction to take advantage of times of moisture. Additionally, like bracken fern today and others, ferns in these environments may have spread predominantly through creeping rhizomes, tubers, and other means of vegetative reproduction. 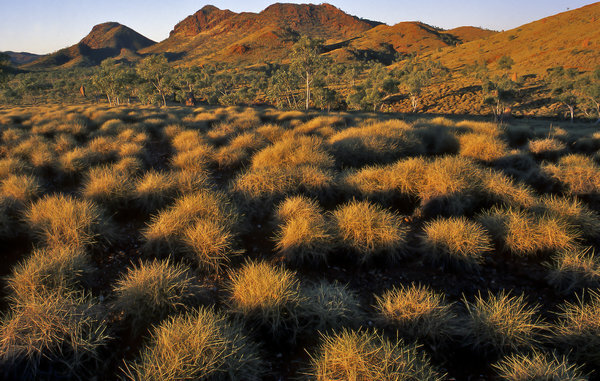 But even these xerically adapted ferns and spreading ferns are plants of niche habitats, they like to grow in a particular type of soil, certain type of rock, or in a particular community of plants- they do not form the vast monotypic stands like grass does in grasslands. And again this forms a problem, in my mind at least, for this concept of the 'fern prairie'. If the fern prairie was such a dominant, ubiquitous biome during the Mesozoic- why are there no modern ferns that can perform this way? I know this is not sound logic "lack of evidence does not mean lack of existence" and of course ferns today have underwent 65 million years of subsequent evolution but I mean, correct me if I am wrong in the comments, if ferns were champions of hot, open, arid conditions throughout the Mesozoic why are they so bereft in this niche today? You might point out the fact that grassland dominance has much to do with mammalian herbivore coevolution but problems remain for me when I attempt to envisage a 'fern prairie'. Grassland do better with grazing because everything gets mowed down and grass just out grows the competition. Were fern prairies the same way? Ferns today are not a favored food of vertebrates, many full of toxins and generally low in nutrition...but this does not imply that perhaps dinosaurs had different tastes than mammals.... and even if dinos relished ferns I don't think they were that nutritious of a food. As I discussed here the reproductive propagules of ferns, enriched with lipids and proteins, may have been a preferred food, especially for growing baby dinos and freshly emerged fiddlehead were likely targeted. But again I am skeptical of vast monotypic 'fern prairies' fashioned like some putative Mesozoic Serengeti. Are there any in situ preserved fern prairies? Well yeah, kind of.... Big Cedar Ridge records a late Cretaceous fern dominated landscape with in situ preserved peatland, river channels, and bottomlands documenting a 3/5 floral assemblages dominated by ferns (esp Gleicheniale ferns) along with associated cycads, palms, mosses and diverse, but rare, angiosperms. But even here I do not think this is an ideal test because it is not a water limiting environment...in short it is an area you would expect to find ferns in even today, And this does reveal a problem with the fossil record for plants, preservation bias. Lowland mesic (wet) environments will be preserved while upland (generally more xeric) environments will most likely not enter the fossil record due to lack of sedimentation in these environments. Secondly as the studies at Big Cedar Ridge testify and also which I discussed in Plant Wars certain plant families may show high diversity, but low biomass compared to other less diverse but more ecologically important plants. And, if certain plants spread predominantly through vegetative means i.e. spreading rhizomes, roots, tubers etc, they may appear unimportant in terms of palynology (pollen record) and wrongfully assumed to be unimportant ecologically. Following this, certain rare plants may dominant palynological records through broadcasting abundant pollen, but in fact be relatively unimportant ecologically. Long story short the fossil record can play tricks on us. But what if any clues does the Big Cedar Ridge (BCR) offer in terms of understanding more arid open habitats and the role ferns played there? If our examples of Mesozoic foliage in situ preserved sites is lacking and we are bound by a biased and sometimes misleading paleo-fossil record- what clues might certain contemporary floras offer in terms of putting these 'fern prairies' in proper context? hydraulic lift and redistribution throughout the year. Basically certain deep tap-rooted plants are able to search out water from deep within the water table and then, during the night, when evapo-transpiration is not occurring, the shallow lateral roots actually leak out some of this water which benefits shallow rooted plants. In this sense these deep rooted plants, such as certain acacia, mesquite, and oak among others, serve as a type of "mother plant" and actually allow plants to survive that otherwise would not. All-right maybe you now see where I am going with this... Did Mesozoic, semi-arid "fern prairies" perhaps operate in a manner similar to the biocrust/ spike moss, chamise combo of California chaparral? Did a putative layer of vegetation such as isoetales, lycopsids, lichens, bio-crusts, lychophytes, and bryophytes provide an insulating layer to ferns/other vegetation that protected roots from high heat stress and water loss? Did certain tap-rooted plants serve as "mother plants" scouring the water table and redistributing water for more shallow rooted ferns and other plants? Maybe the Mesozoic 'fern prairie' is better described as a fern savanna, brushland, or chaparral? The date of course is limited, I will cover some of it in upcoming post(s). But I do believe a carpeting layer of vegetation which I will refer to as Dino Turf (tm) was perhaps ubiquitous and important in open savanna type Mesozoic habitats. Likewise tap-rooted plants may have been part of this one-two punch and allowed ferns and other water sensitive plants to thrive in areas we otherwise would not expect them to. Biological Soil Crusts? What are they and why should I care? Okay, this time you get a backhand for not doing your research. Please look up ashy spikemoss (Selaginella cinerascens) which dominates the "cryptogammic crust" in San Diego. If I had a way of posting pictures, I would. 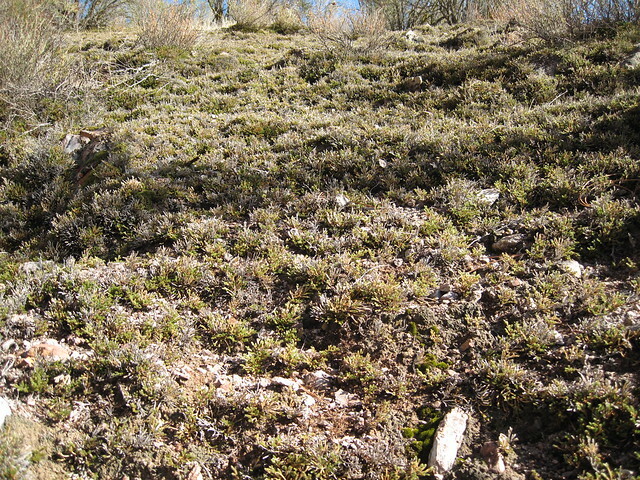 It's mostly been destroyed by land disturbance and annual grasses, but where it hasn't been disturbed, mats of ashy spikemoss are still the dominant land-cover. Then look up bracken-grasslands (e.g. http://dnr.wi.gov/topic/EndangeredResources/Communities.asp?mode=detail&Code=CTHER080WI). Bracken is one of the most bomb-proof vascular plants out there: it's main rhizomes can be 18" underground, with only individual leaves protruding, it's highly invasive and toxic as well. In other words, it's a fern that independently evolved most of the traits that grasses later evolved (protected buds, long-lived rhizomes, and anti-browser defenses). This is probably a better model for a fern-field than what you're pointing to here. Paragraph 4 I do mention bracken so I think getting a "back-hand" is a little harsh. I just can't find any examples from the Mesozoic fossil record where it appears one type of fern dominated entire ecosystems that is why I think suites or guilds of ferns each one adapted to a particular niche makes better sense. If you come across any data pointing to a particular Mesozoic ecosystem dominated by one type of fern please send a reference my way. The Cedar Ridge flora is exceptionally diverse in ferns, which follows this trend we still see today. But the Mesozoic was a loooong time so there was undoubtedly examples of both- monotypic stands of invasive ferns and also diverse fern beds. And thanks for Selaginella cinerascens reference I will look at that, Can't talk about everything!! !